Will there be more calls for investors to sell gun stocks in the wake of the deadliest mass shooting since Sandy Hook three years ago? Probably. But the tragic events in San Bernardino are unlikely to cause any significant change in how Wall Street feels about the firearms industry. Gun stocks are doing extremely well this year, and well-known funds are benefiting. That means, like it or not, you may even own a small stake in a gun stock through your 401(k) or other retirement account. According to data from FactSet Research, Vanguard, Fidelity and BlackRock, which each have hundreds of mutual funds, are the top three shareholders of Smith & Wesson (SWHC) -- the company that made two of the guns used in the San Bernardino shootings. These three fund giants are also among the five largest owners of ammunition companies Vista Outdoor (VSTO) and Orbital ATK (OA). And BlackRock and Vanguard are the second and third largest investors in Sturm Ruger (RGR). The stocks are held in a variety of funds. Fidelity owns Smith & Wesson in the Fidelity Advisor Small Cap Fund and Fidelity Low Priced Stock Fund. Vanguard owns both Smith & Wesson and Sturm Ruger in the Vanguard Small Cap Growth Index Fund. BlackRock holds both gun companies in the BlackRock Master Small Cap Index fund. Some of the funds are passive -- i.e. they mirror market indexes, which means managers aren't really picking the stocks. Their hands are tied. For example, both Smith & Wesson and Sturm Ruger are in the Russell 2000 index, a popular one for small company stocks. Vanguard spokesperson Emily White said in an email to CNNMoney that the bulk of the gun stocks it owns are in its index funds. "Vanguard is among the largest holders of many companies -- and we own at least a small stake in nearly every publicly traded company," she added. BlackRock was not immediately available for comment. But the gun stocks are also owned by some of their active funds, ones where portfolio managers select companies based on their fundamentals. An interesting layer to this: Fidelity actually has no stake in Sturm Ruger, even though it's a top holder in Smith & Wesson. So Fidelity managers are clearly choosing Smith & Wesson over Sturm Ruger. Fidelity spokesman Adam Banker said the company does not comment on individual stock holdings. But he added that "we understand that some investors may choose to advance specific causes, based upon their personal, social or ethical values." And despite numerous mass shootings this year, these stocks have been big winners for investors. Smith & Wesson's stock has nearly doubled in 2015. 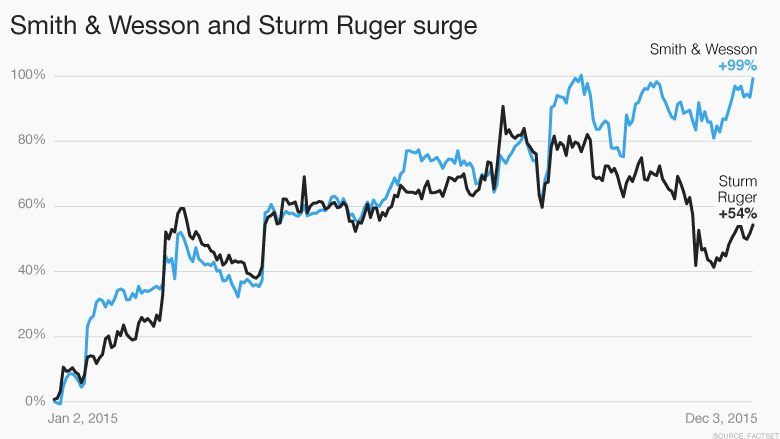 Shares of Sturm Ruger and Orbital ATK are up more than 50%. The proliferation of shootings actually seems to be helping the companies. They boost sales. Calls for stricter gun control laws resurfaced in the wake of the church shooting in Charleston in June and the Umpqua Community College shooting in October. Every time "gun control" starts trending on Google and social media, consumers rush to buy more guns. That's exactly what happened after Sandy Hook in late 2012 and early 2013. It appears to be happening again now. "Fear is the number one driver of gun sales," said Brian Ruttenbur, an analyst with BB&T Capital Markets. FBI background checks for guns hit a record on Black Friday and are on pace for their highest level ever this year. One industry analyst thinks another reason gun companies are doing so well is that Americans simply want to protect themselves -- especially in light of mass shooting becoming more common. "The firearms industry has been on a growth spurt for the past few years. And I think it's more about self-defense than gun laws," said Chris Krueger, an analyst who follows the industry for Lake Street Capital Markets. Still, could the San Bernardino shootings finally be a tipping point? Will big investors decide that they just can't support the industry anymore? On the one hand, pressure is mounting on Wall Street to take action. An organization called the Campaign to Unload, which urges people to get rid of their gun investments, has grown more vocal this year. Rapper Snoop Dogg did a PSA for the group in March. And private equity firm Cerberus Capital, which owns gun maker Remington, finally gave its investors an option to get rid of their Remington investment earlier this year by separating Remington from the rest of its funds. 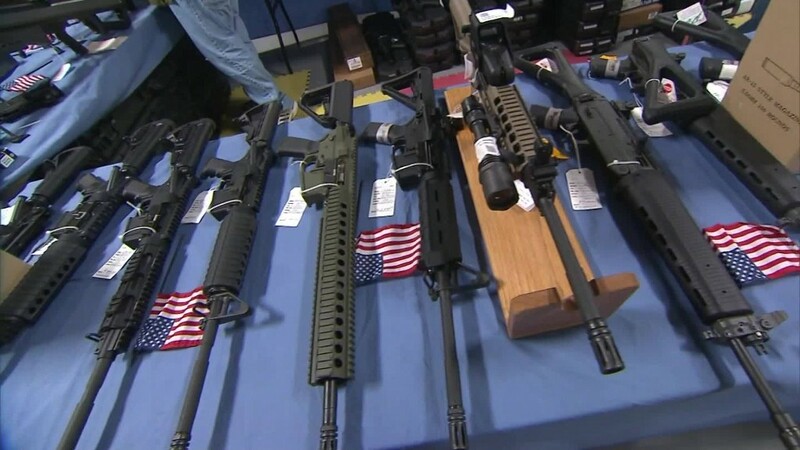 Remington, formerly known as Freedom Group, makes the Bushmaster rifle that was used in the Sandy Hook Elementary School massacre in Newtown, Connecticut, three years ago. Cerberus has tried to sell Remington since then but has been unable to find a buyer. But Krueger, the industry analyst, noted that the main reason Cerberus faced a big backlash over Remington was because many Cerberus investors were pension funds for teachers' unions as well as endowments. Krueger doubts that major mutual fund firms or hedge funds will sell. Ruttenbur agreed. "The people who wanted to get out of gun stocks have already gotten out post-Sandy Hook," he said. "The investors that are left like the industry for the long-term."